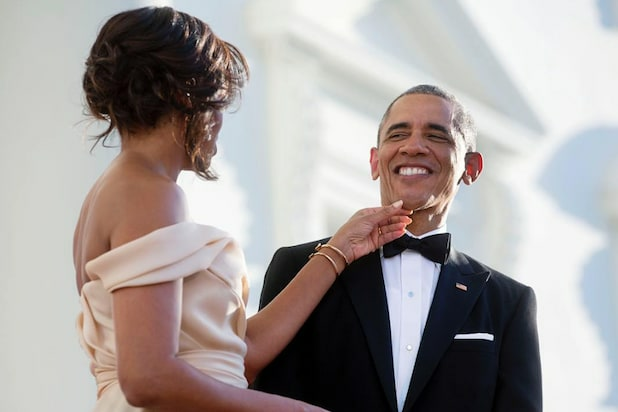 President Obama celebrated his 55th birthday — his last before leaving office — with a big White House bash jam-packed with Hollywood A-listers. Attendees included talk show host Ellen DeGeneres and Portia de Rossi, Common, Fonzworth Bentley, Chicago mayor Rahm Emanuel, NBC’s Al Roker, George Lucas, interim chair of the Democratic National Committee Donna Brazile, retired basketball player Grant Hill, “Good Morning America” anchor Robin Roberts, Sarah Jessica Parker, Pusha T, Samuel L. Jackson, Gayle King, Chris Paul and Timbaland. Usher and Stevie Wonder — Michelle Obama’s favorite artist — performed for POTUS. Rev. Al Sharpton was also there, posting a picture of himself and girlfriend Aisha McShaw. Nick Jonas, who took a break from his tour with Demi Lovato, called the evening “A night I will never forget” on Twitter. NBA legend Magic Johnson and wife Cookie posted a selfie getting ready for the big bash. “Can’t wait to get down — I have on my dancing shoes,” Cookie wrote in her post. @thecookiej and I getting ready to go to President Obama’s birthday party!